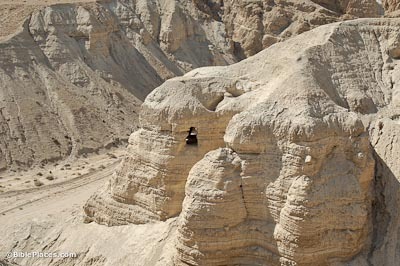 Qumran Cave 4, viewed from the northeast. Photograph by Todd Bolen. Qumran is located in the West Bank, near the northwestern shore of the Dead Sea. The site has a long history of settlement but is best known as the location of the parchment scrolls and fragments called the Dead Sea Scrolls, which were discovered in a series of caves between 1947 and 1956. The scrolls include parts of almost all of the books of the Hebrew Bible, along with many other ancient writings. Some scholars propose that the site was a settlement of a Jewish sect called the Essenes, mentioned by some ancient historians. Cave 4 contained the most significant finds, numbering several hundred scrolls.